I know I have posted about my gratin a number of times before, but the recent discussion about carb and carb combinations has made me want to post about my gratin one more time. 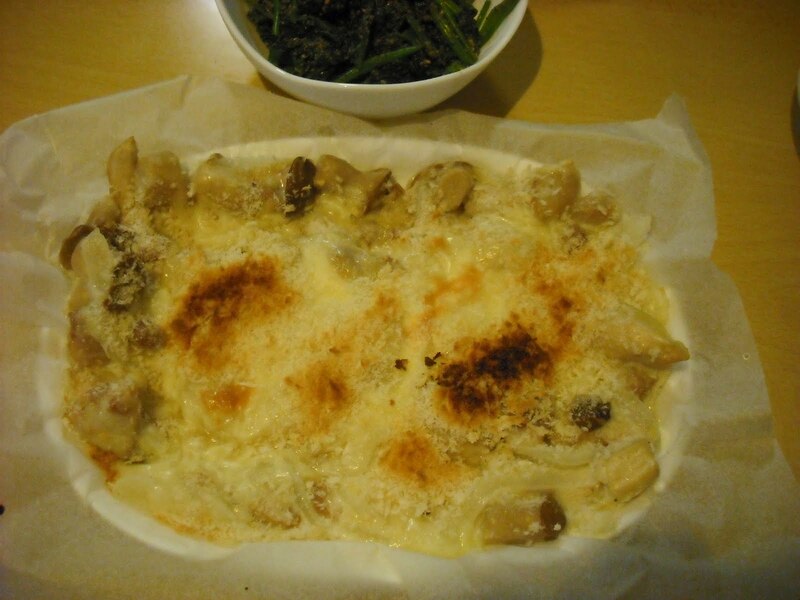 In Japan, a gratin usually contains macaroni, and I used to make a gratin in a usual way, but one day, I thought a carb and carb (macaroni and rice) combination was too much for me, and made a macaroni-less gratin. I liked it because the gratin was much less heavy, and was suitable for an okazu for rice. Now I usually make a macaroni-less gratin. Pan-fry onion, eryingii, and chicken thigh, turn off the heat, sprinkle flour, mix well, add milk, turn on the heat again, and mix well for a few minutes until milk thickens. I transferred half of the ingredients to a tray with parchment paper on it, sprinkled cheese and panko, and grilled in to toaster oven for about 5 min.